And A Player To Be Named Later: Really? So Big Papi was on the smack in 2003? Really? Oh, and Manny as well? Geez people, is this even news? Did anyone believe Manny Ramirez earlier this year when he claimed that he was tested 15 times before and was clean? That the incident earlier this year was just an accident? Did anyone buy that? 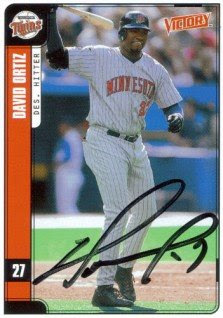 Was no one suspicious when Ortiz went from a middle of the road player in Minnesota to the most feared left-handed hitter in the American League. Did no one find that suspicious? Or when he went from a skinny kid (see the card) to a Yeti? And why does this stuff leak out like this? Who keeps "leaking" these names? Really what's left to say? We suspected Sosa, Giambi, Bonds, Manny, Ortiz and Clemens. And were we proven wrong. About any of them? I really don't think Jim Thome used steroids. He is one of the nicest and most respected players in the game. Most caught steroid users are troublemakers. yep, papi is/was a huge troublemaker. Odd comment about Thome. Not sure how anybody is above suspicion. Agreed no one is above suspicion. I know one of the local sports radio stations has an unofficial copy of the list, but they didn't say who they got it from. Also, since it is unofficial they won't go into who is on it.